Home / Extra-Curricular / OK, so I’ve just bought a Persian rice cooker. Now what? OK, so I’ve just bought a Persian rice cooker. Now what? First thing to do is to pat yourself on the back: this culinary gewgaw will change your (rice-eating) life. In Iran rice cookers are often given as a wedding present – this brand is famous for the longevity of its appliances, and it is not uncommon for them still to be working ten, twenty, thirty years on. In the box you will find a power cable (affix to aforementioned adaptor plug), a measuring cup, a spongy thing (which is what you are meant to use to clean the liner: never use a scourer on it as you will scratch it and there will be no more lovely tahdik). You will also find some quaintly translated bits of paperwork: I’d bin this if I were you. Wash your rice quickly (use a fine sieve for this). The idea is that you use one measure of rice per person (NB – this is a Persian measure, and they eat a lot of rice in Persia: half a measure might be nearer the mark for mere mortals), together with one measure of water per measure of rice, and one generously heaped teaspoon butter per measure of rice. Rice varies, not only between brands but from harvest to harvest, and so you may find you need to add a little more or less water. Add salt as required. Just plug your rice cooker in, and set the colour-graded dial at the bottom to make the required colour of tahdik. Y’all know what tahdik is, right? Because that is surely why you bought this model… Tahdik (literally, ‘to the bottom’) is the sticky golden crust which forms at the bottom of the rice as it cooks (which you then turn out so that the crust is on top, just like a cake). If you don’t want a crust, just set the dial to the palest colour on the dial. Your rice will take about twenty minutes to cook, thirty minutes if you are to get good tahkik. The cooker has a thermostat, so it will turn itself on and off safely and keep your rice warm: but be under no illusion – if you go out in the morning and leave it on, you will have very dry, dark rice when you get home. If you are cooking fancy rice, you can add the raw ingredients (things like broad beans, or French beans, or raw garlic) with the rice at the beginning. Spices and herbs should, for the most part, be stirred through at the end, or you can turn your rice out, crack the crust and stripe your extra ingredients artfully across it. Liquid saffron, for example, is usually trickled on to the rice after it has been turned out. How can I work out what size my cooker is for replacement liner as all in farci! Is 6″ deep and 10″ internal diameter. Also can I drive to Peckham to buy? Need for party this Friday cooking Persian. Thanks for your query. Best thing is to bring the old pan in and we’ll match it – and yes, we do carry them in store. If you do decide to get one via mail order, let me know and I’ll measure them. Fantastic. Are you open till 9 tonight? Am coming over if u are! We don’t currently stock the leads, but I will ask if we can get some sent over. Adaptors are available in most hardware stores – make sure you use 13 amp. I was given a pars rice cooker and would like to make ordinary steamed rice in it. Could you please help? Do I just turn it on to the palest setting and add a little more water if I’m not using butter or oil? Does it all start from cold? Yup – you are bang on. Just use the lowest setting. Received my rice cooker this morning and have just achieved the best – and I mean BEST – tahdik ever. And believe me I’ve tried loads of times using an ordinary pan! Anna you may have it figured out by now but all you need to do is grease the inner pan lightly with olive oil or butter, pop in your rice and use 1 cup of water to 1 cup of rice. If you are using saffron you cam stir that in too. Turn it on. The further round you turn the dial, the crispier your tahbdig. Nooshe jan! 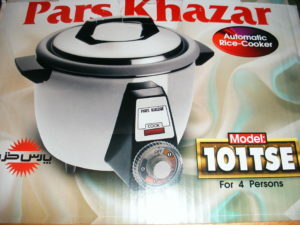 I bought a rice cooker from Iran the brand is called Pars khazar. Do I need an adapter ? Is it a 220V rice cooker?